#IGiveBeyond: Learning nurses in some areas lack lifesaving CPR training, Anita Rich formed Nurses Heart to Heart to help in developing countries. Anita Rich uses her time off from work as a nurse at Emory Johns Creek Hospital to travel. 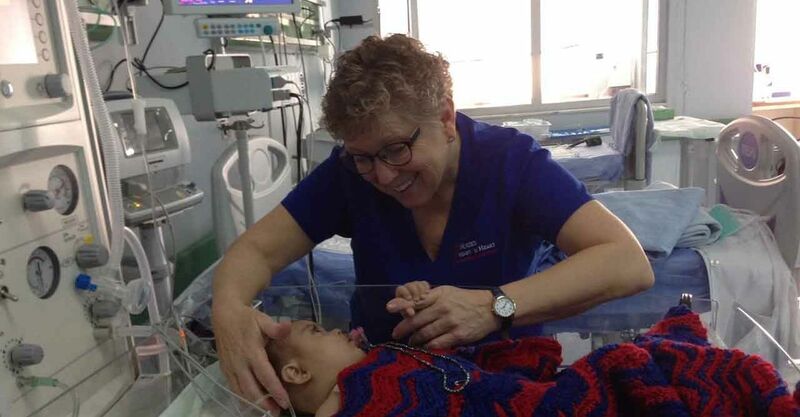 But instead of hitting the beach or relaxing at a resort, she’s more likely to be heading to Iraq or far-flung provinces in Mongolia to help diagnose and treat children with heart defects who have little hope for a healthy life — or any life at all — without medical volunteers like Rich. She’s also created her own organization, Nurses Heart to Heart, to purchase and deliver cardiopulmonary resuscitation (CPR) manikins (medical training devices crafted with moveable heads and realistic chests) to impoverished areas in Mongolia, where Rich and other American nurse volunteers teach life— saving CPR to local nurses. Rich’s work as a nurse, along with her dedication to bring help and hope to the less fortunate in other areas of the world, was inspired by childhood experiences that set her on a career path in nursing and also sparked a love of travel and an understanding that people are people with similar needs, despite cultural differences. As a six-year-old visiting her grandmother, a nurse who cared for newborns and their mothers in a small South Carolina hospital, Rich listened as her grandmother described “abiding” the night before with a grieving mother whose baby had died. When Anita asked what that meant, her grandmother explained nursing was more than a profession of helping with medical treatments. It also involved abiding with patients — comforting and caring when there was nothing else to do. “I decided right then, I wanted to be a nurse,” Rich recalled. Because of her father‘s career as a U.S. Army officer, Rich’s family moved frequently when she was a child, living in Germany and Korea, as well as throughout the U.S. And everywhere they went, her parents were involved in volunteer work in local communities, helping out, along with their children, in orphanages and pitching in to build churches using leftover materials from projects on the army base. Living in Korea for two years made a strong impression on Rich. “I learned there’s a whole world out there, and there’s so much anybody can do to make it better,” she said. After graduating from Emory University’s Nell Hodgson Woodruff School of Nursing in l981, Rich worked as a nurse in the hematology oncology bone marrow transplant unit at Emory University Hospital for two years and has worked for 35 years in cardiology. She is a certified heart failure nurse and is the heart failure coordinator at Emory Johns Creek Hospital in suburban Atlanta. It wasn’t until 2007 that Rich began volunteering in far-off areas of the world. She jokes the impetus was the result of a severe case of empty nest syndrome. Her two children were grown and, after seeing her daughter off to college, Anita told her husband of 33 years, David, she needed to find something to do in her spare time. Working for Emory gave Rich the flexibility of trading shifts with other nurses in order to travel for volunteer work, so she signed up for the World Medical Missions arm of Samaritan’s Purse, a non-profit nondenominational Christian organization that sends volunteer medical help to areas in need around the world. Soon she was tapped to be a nurse transporter for the organization’s Children’s Heart Project, which flies children with congenital heart defects to U.S. hospitals that have donated surgery and care for the youngsters. Her first trip was to Kosovo, and other trips followed: to Uganda, Honduras, and Mongolia. While in Mongolia, she learned of another medical mission organization, For Hearts and Souls, which brings medical volunteers to developing countries for two weeks a year to screen children for congenital heart defects and to perform surgery when possible, while teaching the local medical and nursing staff. Rich called the organization and explained she had no experience working with surgical repairs on children — but she was immediately told her skills were needed and was asked to join a 2008 trip to Mongolia. The first day she was there, Rich and other nurse volunteers set up a nursing conference with two CPR manikins to show a large group of local nurses how to position a patient’s jaw to maintain an open airway. A Mongolian nurse who spoke no English tried to communicate a question by pumping her fist up and down over a manikin’s chest. A translator explained the woman wanted to know if Rich could teach her how to “pump the chest” to perform CPR. It was a “light bulb” moment for the Emory nurse. She soon learned from translators that local nurses were not trained in CPR because there was no money for the needed medical manikins. The group meets with the minister of health of each province and then teaches CPR in the morning and afternoon to as many people as want to come. They also donate two adult, two children, and two infant CPR manikins at each site. This year they are also donating four labor and delivery manikins. “We tell the nurses ‘today you are the students, but tomorrow you will be the teachers,’ ” Rich said. On one trip, a Mongolian nurse, who had been trained in CPR by Rich on a previous Nurses Heart to Heart visit, approached Rich and held onto her arm, talking excitedly. A translator explained that the woman wanted Rich to know the local nurses had taken the manikins and what they learned from the American nurses about CPR and “played it forward”— teaching everybody in their local hospital how to do CPR. “We’ve saved hundreds of lives, and many of them were children,” the woman said in her native tongue. Rich explained she is stunned by the impact the CPR training has made. Anita Rich’s cousin, Tanya Owens, who is also a graduate of Emory’s School of Nursing and a certified nurse midwife, is now volunteering with Nurses Heart to Heart — working with midwives and nurses in small Mongolian provinces to teach them emergency labor and delivery skills while Rich and another Emory nurse, Jane Thomas, teach CPR. They are also joined by four Mongolian nurses each year who help teach. Rich continues to also volunteer with For Hearts and Souls, traveling several times to the Kurdistan area of Iraq. On a trip there in January of 2016, she arrived at 3 a.m. to begin an hour’s long journey with three American physician volunteers, traveling in unmarked cars with drivers who spoke no English. After passing through several check points in the war-torn country, they arrived at a hospital in Dohuk, where a waiting room was filled with worried parents and their children. It was a group of people with different ethnicities and beliefs, but all had one thing in common — they wanted help for their children. Rich, the only U.S. nurse, worked with the three U.S. physicians screening children with life-threatening heart defects and caring for them in the ICU after their cardiac cath procedures. She also worked with and taught Iraqi nurses in the ICU. Often the volunteers can help and save lives. Sometimes, there is nothing to be done and, Rich noted, all they can do is, as her grandmother would say, abide with the parents. She admits some people have questioned her for travelling to potentially dangerous places, such as Iraq. “They say ‘what are you thinking?’ And I tell them I’m thinking there’s a need and I can fill it,” she said. Rich is hoping to find more ways to help and, to that end, she’s working on a doctorate of nursing practice degree.